This training manual has been written for agricultural extension workers, government field officers and non-government organisations training staff. • set up a kokorako system as a small business. 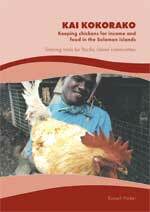 The book is based on the work of Russell Parker, an Australian poultry expert with experience in the Solomon Islands.